Tibus Review 2019: Is Tibus a Good Hosting? Tibus is a website hosting provider for enterprise-level companies. They do not offer shared hosting since they focus solely on bespoke packages of dedicated servers and virtual private servers. Founded in 1996, Tibus provides website hosting and streaming services to clients in the United Kingdom and Ireland. Their customers include large enterprises and public sector organizations. Needless to say, their website and support are both in English. Tibus only offers enterprise-level website hosting. They do not offer shared hosting. 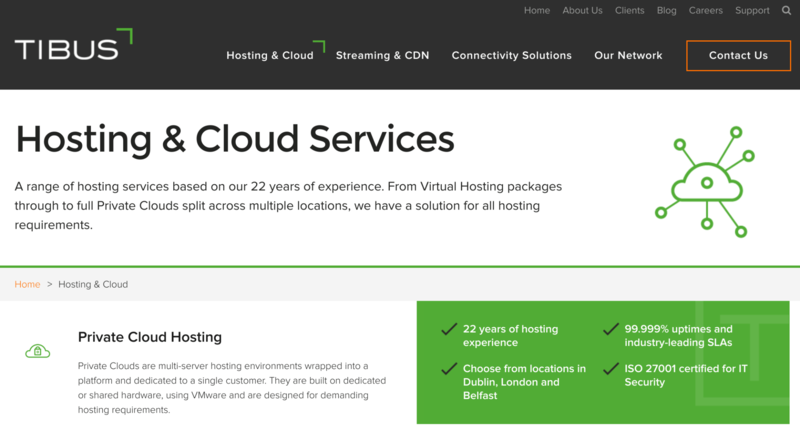 Their services include dedicated website hosting, virtual private servers, hybrid cloud servers, colocation, streaming and CDN, and connectivity solutions. Since Tibus targets premium features to large businesses and enterprises, they are too expensive to appeal to smaller businesses. Their servers are housed in Tier III or Tier IV data centers in Dublin, London, and Belfast, which means 99.8 – 99.9% uptime is guaranteed. There is also a full backup system in case of outages or faults. I really like the transparent process for onboarding new clients. Unlike shared hosting providers, getting set up with a dedicated server or virtual private server is more complicated, and each new client has their own specific set of requirements. However, Tibus does a great job of mitigating this issue and making it less daunting by displaying a clear process (an “order of play”) on their services pages. So, instead of a one-size-fits-all package, Tibus is able to work with your company to create a bespoke solution that includes a service level agreement (SLA) designed to meet your business needs. Tibus does not advertise any specific plans or prices. This may be a little inconvenient for small businesses who are looking around for the best deal, but that’s not who Tibus is targeting with their bespoke solutions for big enterprises. Upon requesting a quote for my particular requirements, I was pleased to see that the quote came back in line with other comparable local and international competitors. You can contact Tibus technical support in several ways: telephone, email, or social media channels. Sadly, they do not have live chat, which is my preferred contact method. I was able to summon assistance via Facebook Messenger, but it took almost 24 hours to receive their friendly and well-informed response. Tibus is an enterprise-level website hosting provider primarily for clients in the United Kingdom and Ireland. They work with large clients including governmental organizations such as the Office of the Attorney General and the Northern Ireland Assembly. Wondering how Tibus stacks up against other Web Hosting companies? Enter any other Web Hosting company and we will give you a side-by-side comparison.